How to series for Electric shift outdrive forward or reverse coil repairs. 680 Loctite is used on this bearing retainer (gear-head-assembly) to install 3 seals when rebuilding 1971 to 1977 OMC stern drive. Sandblast or wire brush lower unit outdrive area, so not particles fall into stern-drive when we pull gear-head assembly out. Clean out screw hole with 13/64 drill. Drill out 5/8 inch deep. Tap size is 1/4 inch 20 national coarse thread. Re-tap about 1/2 inch deep. Only 2 bolt holes required. Remove the 4 screws from gear head assembly. Install new o rings P/N 87620. 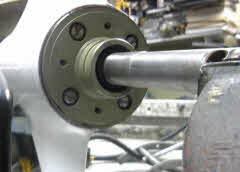 Remove gear-head with bearing carrier puller. Can allso just pry out just holding screw. Remove by hand after 3/8 of an inch. 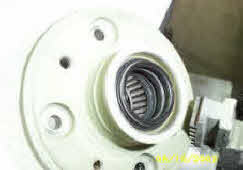 Notice groove on oil seal area the lower part of drive shaft . 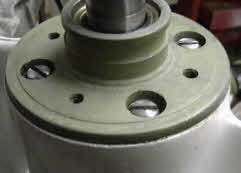 Lathe will be required to machine front face to hold extra oil seal. Machine new oil seal area to 1-1/2 inch, you can be over by up to .007 if using 680 and .003 with 609 green Loctite retaining compound. Note Loctite products are listed under tools if you need to purchase this item. 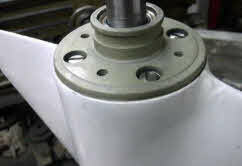 Remove old seals and bearings by pushing on bearing. Then sandblast or wire brush old gasket compound off gear-head assembly. Note Johnson gasket retaining compound is listed under tool if required. Press only half way if you are not replacing with new bearing. Loctite must be applied to outside on three seals. Now you can install bearing 1st and seals after. 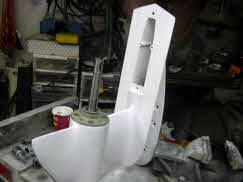 Cover bearing, seals and o-ring area before painting with zinc chromate primer. Place 2 or 3 coats of clear lacquer over that to stop corrosion. Insert 3rd oil seal till flat on top.